the blackest substance ever, as it can absorb 99.96% of radiation in the visible spectrum. In 2016, the British artist Anish Kapoor bought the rights to possess this material for artistic use. This gesture irritated artists all over the world and so a protest was started on social media using the hashtag #sharetheblack. 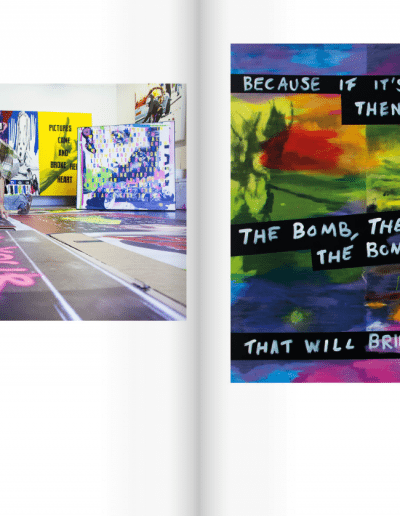 Amongst the frustrated was Stuart Semple, a British artist well-known for his colourful and political works with strong references to Pop Art. 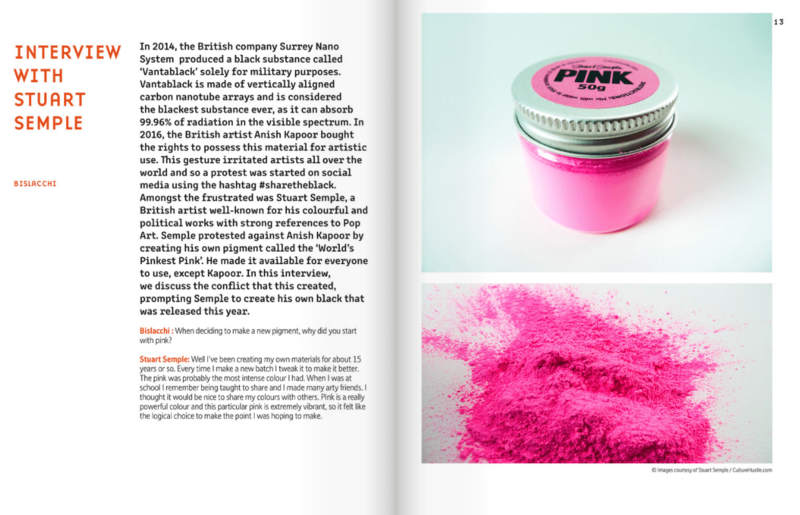 Semple protested against Anish Kapoor by creating his own pigment called the ‘World’s Pinkest Pink’. He made it available for everyone to use, except Kapoor. 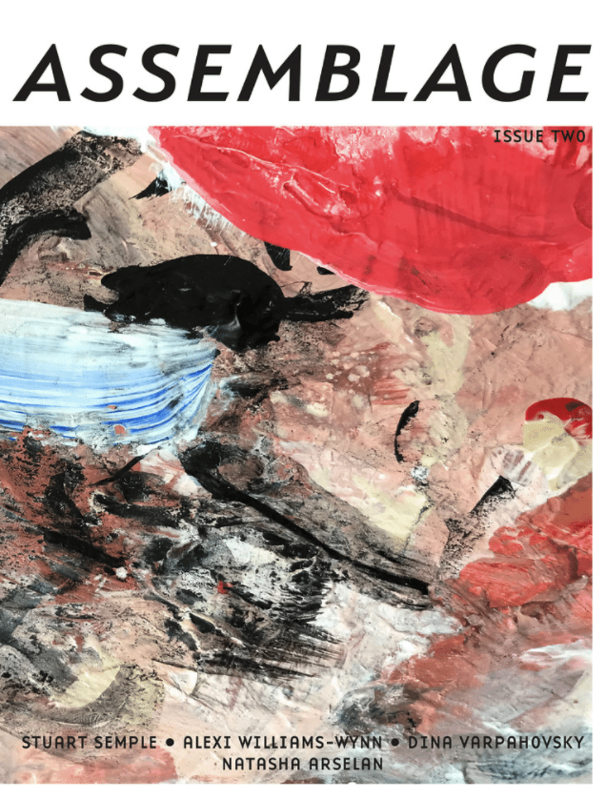 In this interview, we discuss the conflict that this created, prompting Semple to create his own black that was released this year. Bislacchi : When deciding to make a new pigment, why did you start with pink? Stuart Semple: Well I’ve been creating my own materials for about 15 years or so. Every time I make a new batch I tweak it to make it better. The pink was probably the most intense colour I had. When I was at school I remember being taught to share and I made many arty friends. I thought it would be nice to share my colours with others. Pink is a really powerful colour and this particular pink is extremely vibrant, so it felt like the logical choice to make the point I was hoping to make. B: I must say it was very successful when it came out, I even bought some for myself! 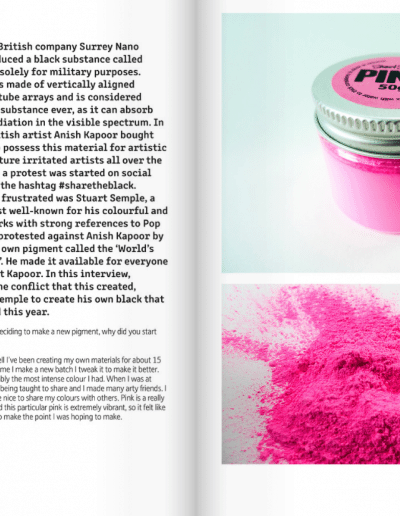 Do you know how many grams of pink paint have been sold so far? SS: Oh thank you! I hope you are enjoying it. Yes it took on a life of its own, I was expecting to sell maybe 2 or 3. Wow! I just looked it up… we’ve actually sent out 225,300 grams. That’s mind-blowing. Nearly a quarter of a million grams. B: After the success of this, people started to ask you for new colours. So you went on to produce the World’s Yellowest Yellow, the World’s Greenest Green, the World’s Loveliest Blue and the World’s Most Glittery Glitter. Was this just something that developed naturally, or it was already part of your plan, to pave the way for BLACK 2.0? is one thing but making them safe and distributing them worldwide is another. There was no master plan or anything, I just worked through the colours, finishing them off and improving them. 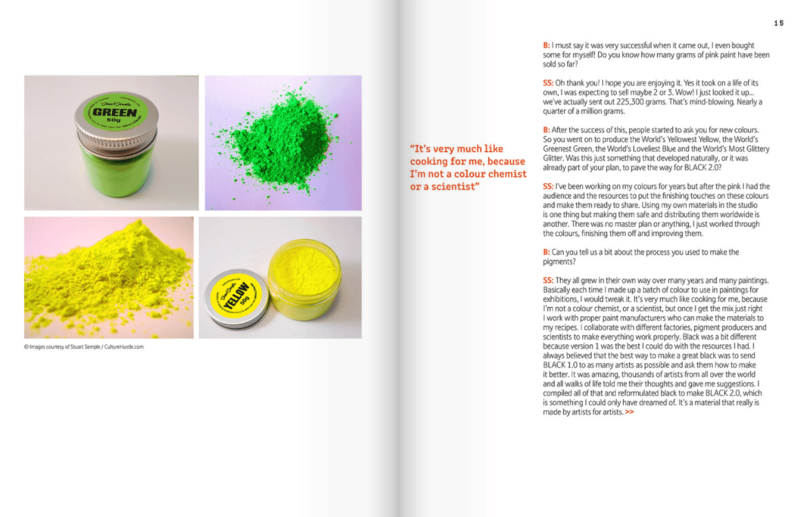 B: Can you tell us a bit about the process you used to make the pigments? it better. It was amazing, thousands of artists from all over the world and all walks of life told me their thoughts and gave me suggestions. I compiled all of that and reformulated black to make BLACK 2.0, which is something I could only have dreamed of. It’s a material that really is made by artists for artists. B: And what about the process you used to make the World’s Most Glittery Glitter? 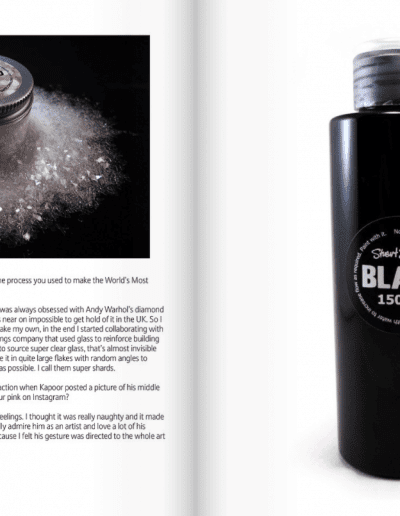 SS: The glitter, well I was always obsessed with Andy Warhol’s diamond dust works but it was near on impossible to get hold of it in the UK. So I set about trying to make my own, in the end I started collaborating with an architectural coatings company that used glass to reinforce building coatings. I managed to source super clear glass, that’s almost invisible and get them to make it in quite large flakes with random angles to reflect as much light as possible. I call them super shards. B: What was your reaction when Kapoor posted a picture of his middle finger dipped into your pink on Instagram? SS: It really hurt my feelings. I thought it was really naughty and it made me sad because I really admire him as an artist and love a lot of his work. 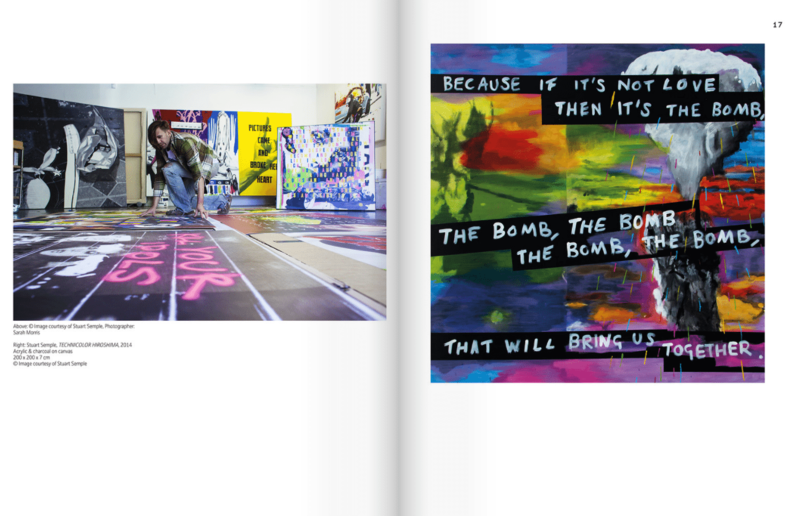 I was upset because I felt his gesture was directed to the whole art community. B: Artistically speaking, what do you think would, or could, have happened with Vantablack if Anish Kapoor hadn’t got his hands on it? SS: I’d like to think that other artists may have worked with the creators of it and we’d have seen some spectacular works by a variety of inspired minds. Maybe over time it would have developed into something useful for all of us. I can only imagine what would have happened if amazing technology like a microchip was only usable by one mind or cadmium yellow was only used in one person’s work. It would be quite sad. 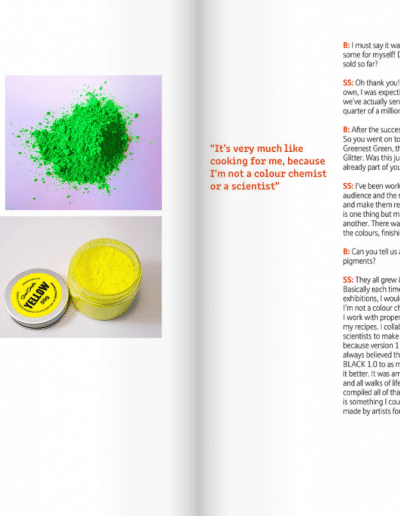 B: Do you think you would have gone on to make these pigments anyway? Can we forget about the Vantablack forever now, with your super black around? SS: I was making the pigments but I was just going to use them for my own work, but the Anish thing made me realize that hoarding stuff so you are the only person that can have it is not very nice. If it wasn’t for the pink taking on a life of it’s own I’d have never had the resources to share all the materials I have. Well no, I don’t think we can forget about Vantablack, it’s still an incredible substance and it’s blacker than our black, it is still the blackest. It will do incredible things for astronomy and science and is an important material. I’m thrilled we’ve been able to get our heads together and make our black though and I’m so excited to see people using it. I’m glad we’ve got a good enough second best. 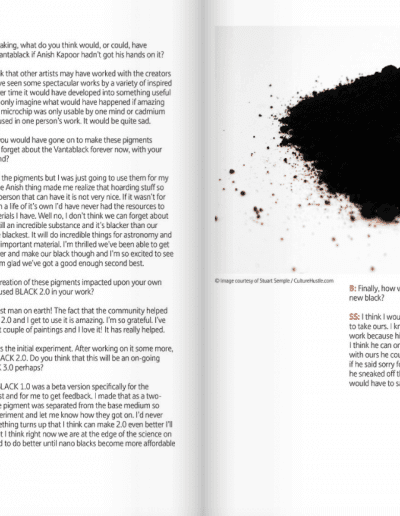 B: How has the creation of these pigments impacted upon your own work? 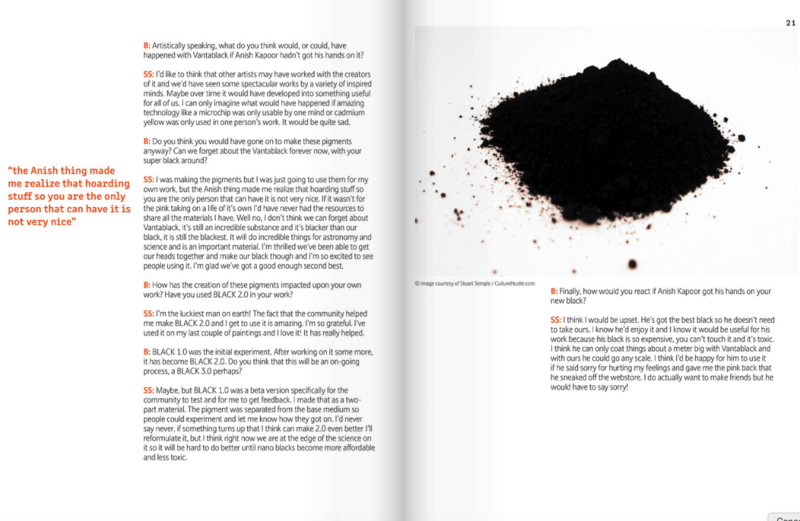 Have you used BLACK 2.0 in your work? SS: I’m the luckiest man on earth! The fact that the community helped me make BLACK 2.0 and I get to use it is amazing. I’m so grateful. I’ve used it on my last couple of paintings and I love it! It has really helped. B: BLACK 1.0 was the initial experiment. After working on it some more, it has become BLACK 2.0. Do you think that this will be an on-going process, a BLACK 3.0 perhaps? SS: Maybe, but BLACK 1.0 was a beta version specifically for the community to test and for me to get feedback. I made that as a two- part material. The pigment was separated from the base medium so people could experiment and let me know how they got on. I’d never say never, if something turns up that I think can make 2.0 even better I’ll reformulate it, but I think right now we are at the edge of the science on it so it will be hard to do better until nano blacks become more affordable and less toxic. 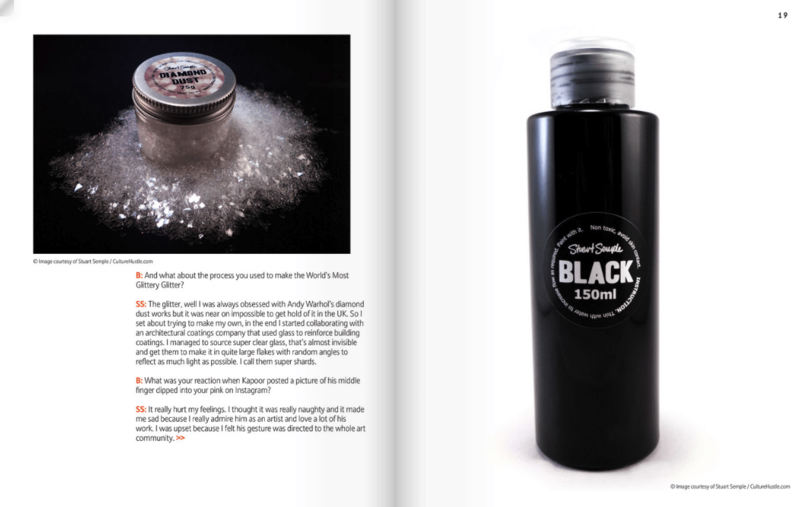 B: Finally, how would you react if Anish Kapoor got his hands on your new black? if he said sorry for hurting my feelings and gave me the pink back that he sneaked off the webstore. I do actually want to make friends but he would have to say sorry!